2017 was a year of positive innovation for AlphaLogix. We’ve continued to work closely with Sage and also other Partners to develop and refine our suite of popular Additions to Sage software. Last year we launched AlphaCheck for Sage 50 – an application developed in association with CreditSafe – that enables you to perform and analyse detailed company credit checks and receive business intelligence from 230 million customers worldwide, all from within Sage 50. We have also recently launched a powerful Mobile Sales Order App for Sage 200 and it’s already making positive waves within the Sage 200 community. We’re excited about the future of our Mobile Sales Order App because the feedback that we have received from the sites that are using it is so positive. Our Mobile Sales Order App is saving businesses considerable time and money, whilst improving the service that they provide to their Clients. Our Mobile Sales Order App will provide your mobile workforce with the ability to manage their Customer Accounts whilst out on the road with complete control over which accounts each member of your workforce has access to – without the need for any additional Sage 200 licenses! 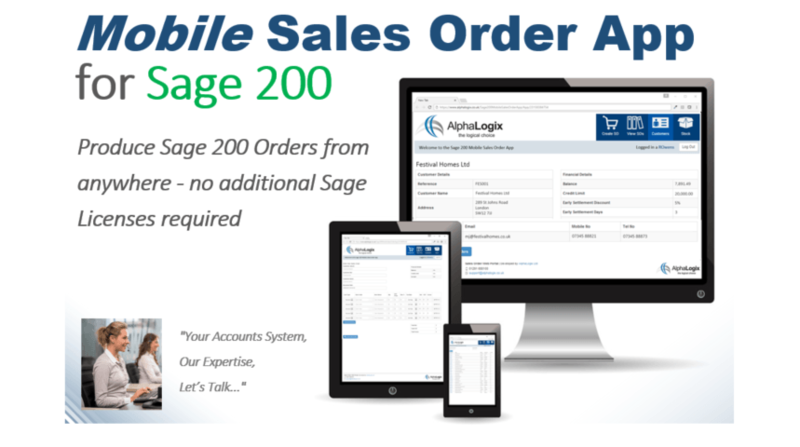 Our Sage 200 Mobile Sales Order App allows your users to access the most important real-time Customer information and raise Sales Orders directly into Sage 200 from anywhere with internet access, from a desktop PC or a mobile tablet device. • Input Sales Orders directly into Sage 200 from a Mobile device without the need for any additional Sage 200 licenses. 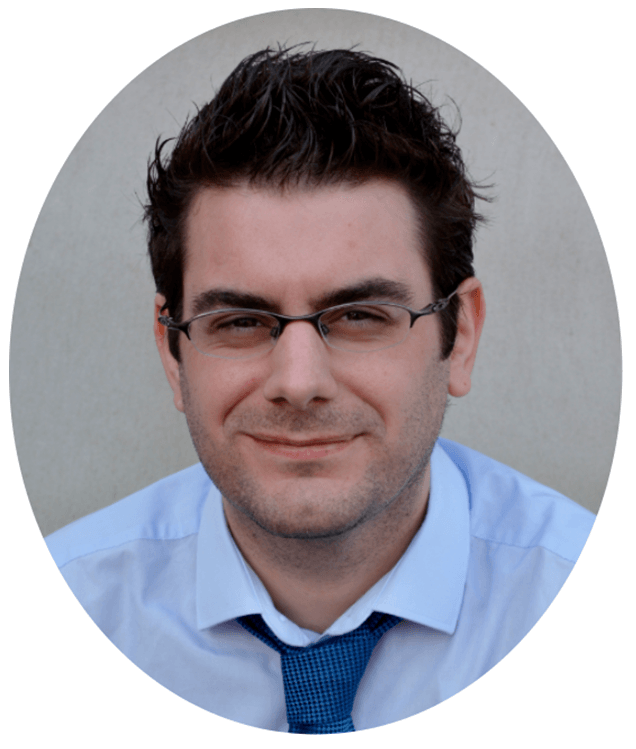 • Integrates directly with Sage 200. • Review important Customer information such as Credit Limit, Hold status, Balances, Discounts. • Access Customer information and raise Sales Orders from anywhere with an internet connection. 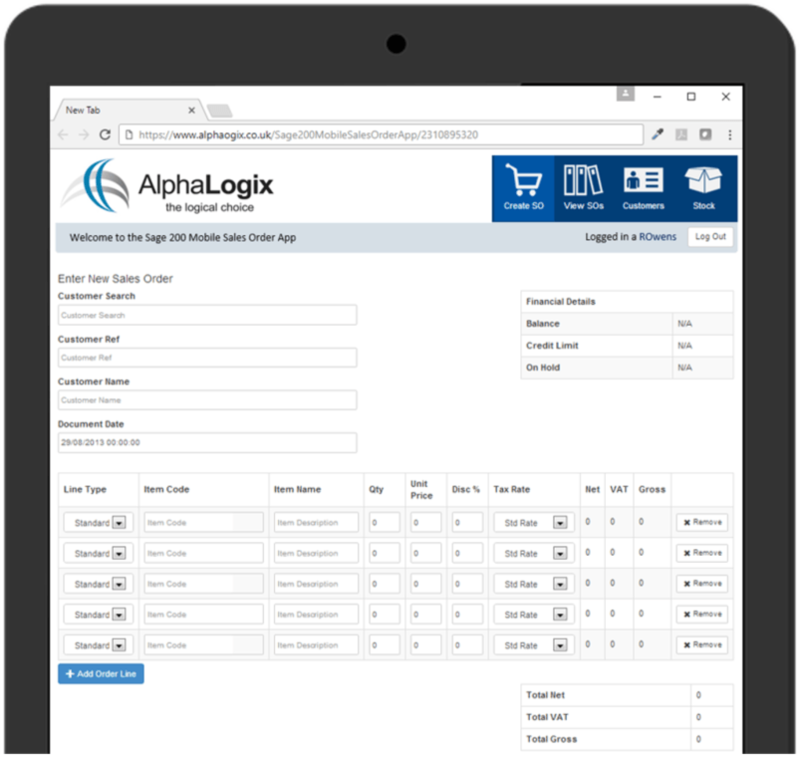 • Designed to work extremely well from a tablet device so your Sales staff can raise orders whilst they’re with a Customer. • Manage which Customers each of your Sales staff have access to and which accounts they can raise Sales Orders for. • Provide your Sales staff with the ability to check stock levels whilst out on the road or with a Customer. Our team of fully Accredited Sage Software Developers have created the Mobile Sales Order App to be extremely user-friendly. Whether your staff are making customer and stock enquiries or entering Sales Orders whilst they’re out visiting their Customers, our Mobile Sales Order App does not require any technical knowledge in order to get the most out of it. Raising a Sales Order is a quick and straight-forward process with our Sage 200 Mobile Sales Order App. 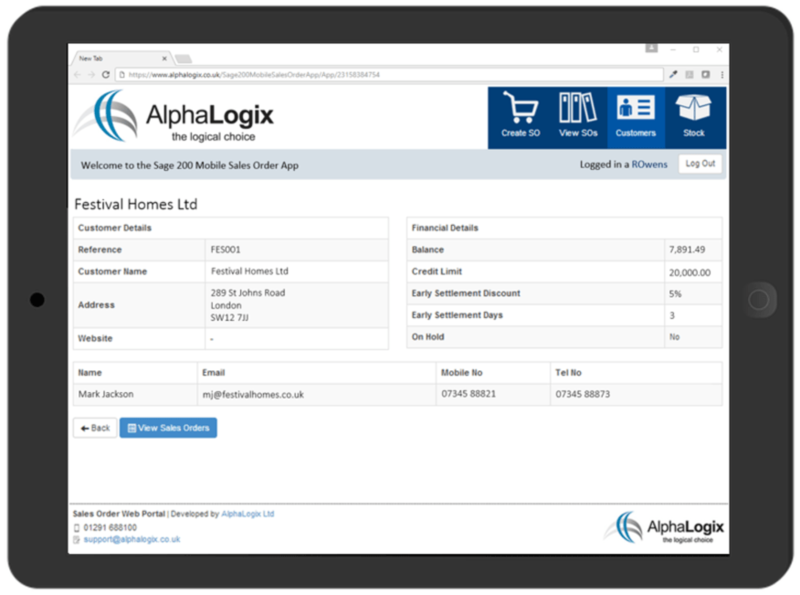 Once the Customer is selected, items can be added to the Order with important information such as the Unit Price and invoice/delivery addresses being pulled from Sage 200 in real time. 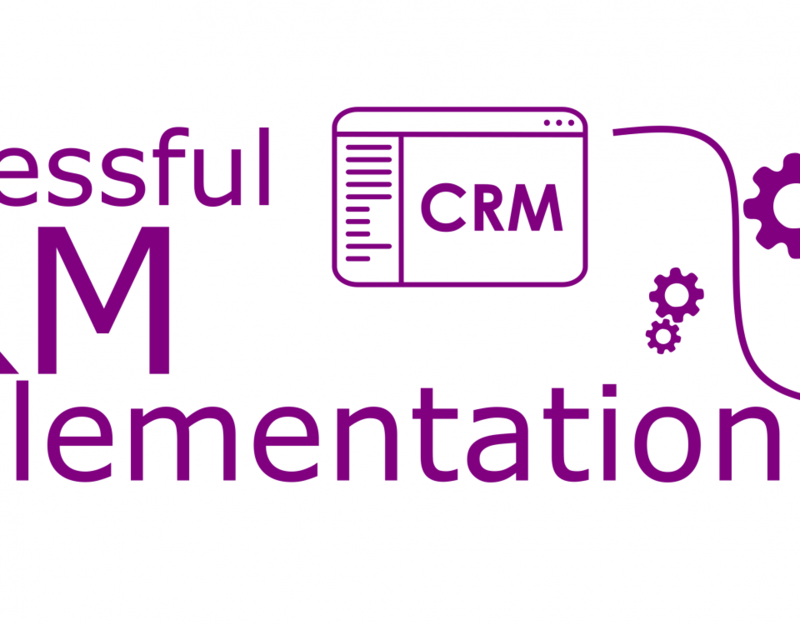 A customer signature is captured at the point of order creation which is placed onto the Order Acknowledgement document, and the Sales Order is immediately created in Sage 200. Our Mobile Sales Order App works extremely well for many of our sites ‘out of the box’ and it is also possible to customise the App to suit the way your business works. Our team of fully Accredited Sage 200 Product Specialists are keen to discuss your unique requirements to ensure that our Mobile Sales Orders App works for you, exactly how you need it to, so get in touch for a free demonstration and quotation today!